«Gstaad Palace» – sanctuary of luxury rest! All the attention of the traveler, arriving in the evening in the alpine town of Gstaad, is attracted by a snow-white castle, which like a soaring in the clouds surrounded by lights, a very fascinating sight. The majestic building, towering among the forest on the mountainside, is equally impressive in winter and in summer. This is the famous hotel Gstaad Palace. Guests are invited to cozy restaurants, lively bars and discos, trendy shops, and all kinds of sports entertainment, a beauty and health center - all this and much more for your enjoyment in the heart of the Alpine mountains! Anja Ullmann – Director of Sales & Marketing Gstaad Palace, with pleasure agreed to answer the questions posed by our Managing Director Vasily Maslov. V.M: Mrs. Ullmann, could you tell a little about location of the resort, its sights and peculiarities? A.U. : The holiday region of Gstaad is located in the south-west of Switzerland in the magnificent Bernese mountains at an altitude between 1,000 to 1,400 metres, and is considered one of the most luxurious destination in Switzerland. Alpine authenticity, proudly maintained traditions and a touch of glamour give a special flair and make Gstaad so refreshingly different from the rest of the world. Gstaads’ most prominent feature is the legendary Gstaad Palace, a picturesque fairytale castle that sits on a hill overlooking the village. At night, the Palace is lit by spotlights and the eves of every chalet in the village are illuminated by strings of small white lights. Adding to the charm of this winter marvel is that the town is car free and all destinations are a close walk away. V.M. : Impressively, I can imagine what a beautiful view! Like a fairy tale! Could you not give a photo of the territory where your hotel is located? I would like to make sure that the hotel has an impeccable view! By the way, could you tell us about the creation of your hotel? Who is the owner? Do you have any funny facts or stories related to the history of the hotel? A.U. : Yes, here are some pictures, please. The Gstaad Palace was opened in 1913 and is one of the last family-run Grand Hotels of Switzerland, managed now by the third generation of the Scherz Family. In the 1960s gala dinners with international stars such as Louis Armstrong and Marlene Dietrich cause a great sensation and in the 1970s the Palace became the film set for the film of “The Return of the Pink Panther”. There are many interesting anecdotes about the Gstaad Palace, but this one is definitely legendary. Do you know the Palace’s gold vault? The original purpose of the bunker at the Gstaad Palace was unknown for a long time. But the puzzle has now been solved: Where the La Fromagerie now stands was once a gold bunker of the Swiss Bank Corporation (SBG, now UBS). It had installed a massive vault under the Palace terrace in 1939/40 as a precautionary measure. If the bank had been forced to abandon its offices close to the border, its board of directors could be evacuated to the Palace. Among other things, gold was stored here. Now the vault houses the best fondue restaurant in Gstaad, serving Saanenland’s true gold: cheese. V.M. : Oh, really interesting and funny story it is! If directors have been evacuated to the Palace – they would stay there for a while, so what can you say about your accommodations facilities? A.U. : The Gstaad Palace offers 90 stylishly decorated rooms of which 31 are suites. Whether it’s a double room or the spectacular Penthouse Suite – every room exudes alpine elegance, subtle luxury and magical views over the Swiss mountains. We always keep the place with the times and do constant renovations. From this summer season, the Gstaad Palace offers five brand new Double Superior Rooms. V.M. : Wow, that sounds exciting! I think this will interest our tourists very much. And what interesting things can you offer for families? A.U. : The Gstaad Palace is a family friendly hotel and offers children an exciting programme and a variety of kids’ events with a whole load of fun. The hotel features a play room and a games room to keep older kids entertained. The Olympic-sized outdoor pool is extremely popular in the summer and there is even a bouncy castle. We are particularly proud of this as we also want to make young guests perfectly happy in Gstaad. We offer family packages and many of our rooms can be individually linked for convenient family combinations. V.M. : I think that the inflatable castle can be compared well with the main sight of Gstaad. And how the children will be happy! What is so exciting in terms of entertainment your hotel can offer? A.U. : We offer wellness at the most beautiful spa in Gstaad. The Palace Spa is spread on 1,800sqm and includes eight treatment rooms, a private spa, saunas, steam baths, a lounge with fireplace, an indoor pool, an outdoor pool with Jacuzzi and a unique Hammam experience. There is as well a fitness room with high-quality Technogym equipment, the option to book a personal trainer and an activity room where we offer Pilates, yoga, fit-boxing and many more activities. You can even play squash here. So be prepared and take your sportswear! V.M. : Yes, you need to keep yourself in shape even when you are on vacation! Really, after a hard workout you can have a good rest, for example, pampered in a jacuzzi! And what about a musical evening? Does your hotel arrange any concerts? Are there any singers or bands? A.U. : Every evening we offer live music in our Lobby Bar. We have different singers and bands coming in to make sure you enjoy your quality time at the Gstaad Palace. And if you are looking for the perfect place to party, experience an exciting party night with our resident DJ “Jim Leblanc” at our GreenGo nightclub. Discover for yourself its unparalleled 1970s design and unbelievable dance floor floating above the swimming pool. V.M. : Oh, I see in your hotel you can have the time of your life! Definitely you won’t get bored! The most frequent question that interests our tourists is how to get to the hotel from the main airports and railway stations? A.U. : You can reach Gstaad from international airports either by car or train. The destination of Gstaad benefits from a comprehensive Swiss public transportation, both within the region itself and beyond. The train station in Gstaad is just 900 metres away from our hotel and if you let us know your arrival time and we’ll pick you up from the train station. On request we also organize transfers from the all Swiss airports. V.M. : The truth is very convenient to get to the hotel. Surely everyone is very interested, from which countries do your tourists come from? Maybe from Spain, Germany or France? A.U. : We have a very international clientele. Most of our guests are Swiss, American and British. We also have clients from the rest of Europe, Middle East, India and China. V.M. : And finally, the last question, but not the least. Our readers are very interested, why should they choose your hotel? A.U. : The holiday destination Gstaad is one of the largest and most diverse winter sports regions in Switzerland. It is the perfect place for fun-filled skiing experiences on a range of superb slopes – 200 kilometres nestled between 1,000 and 3,000 metres above sea level: Family-friendly ski lifts, kilometers of downhill runs and the only glacier ski area in the Bernese Oberland, where winter sports can be enjoyed from the end of October to the beginning of May. V.M. : Yes, the resort in fact, amazing, but it is a large number of other no less good hotels. Why choose exactly your hotel? A.U. 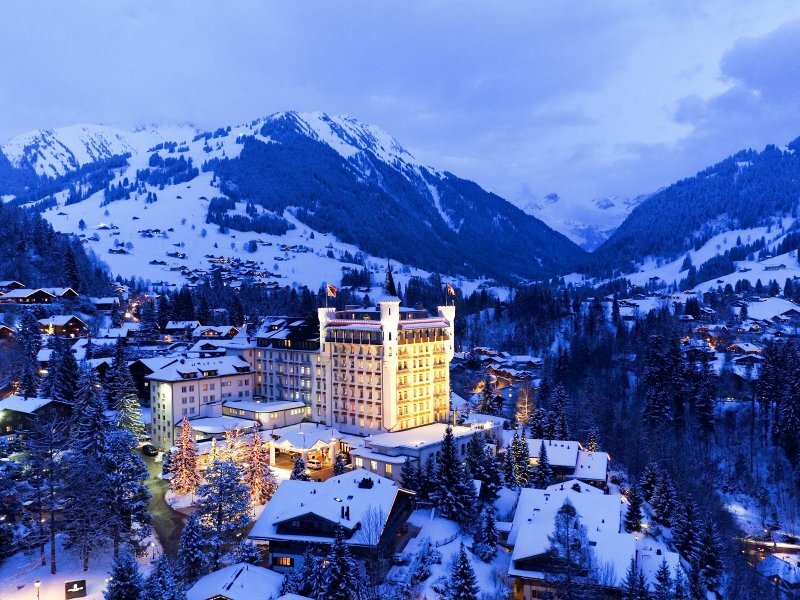 : But why staying at the Gstaad Palace? Over the years the Gstaad Palace has earned an unrivalled reputation for discreet, refined hospitality, and has always welcomed the most discerning international clientele. It is a flagship among the Swiss luxury hotels and considered the landmark of the destination. The hotel - charm, the hotel - history, the hotel - romance. Luxury and refinement in every detail. Stunning cuisine. Beautiful rooms with magnificent views. Rooms with a bath in the bay window - stunning views of the mountains. Excellent pool and spa. At night you can hear the murmur of a mountain stream. Interesting fact, that it was here that the government of Switzerland was betting during the outbreak of the Second World War.